Arden Grange Rich in Fresh Pork & Rice is the latest recipe which has a high meat inclusion of 19% fresh pork and 24% pork meat meal. It also contains sweet potato which is a source of selenium, B vitamins and zinc. There is a unique blend of natural supplements and nutrients which help to promote all round health and vitality in dogs. Only the highest quality ingredients are selected to create diets which have no artificial colours, flavours or preservatives. Prebiotics are present to aid in healthy digestion, essential fatty acids to promote a strong and healthy skin and coat, and extra vitamins and minerals support the immune system and dental health. 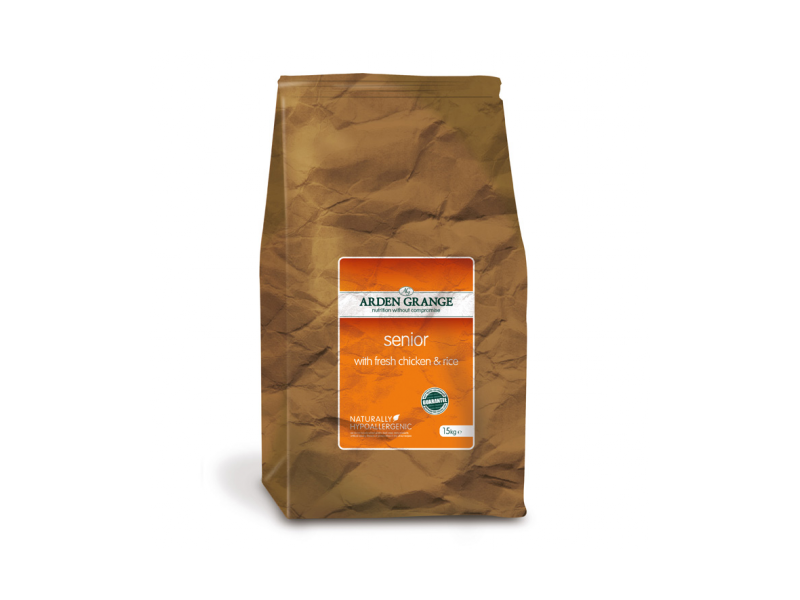 As with every Arden Grange diet, Rich in Fresh Pork & Rice is naturally hypoallergenic as there are no wheat gluten, beef, soya or dairy products in the diet. This may reduce the risk of dietary intolerances and allergies that can cause digestive disorders and skin complaints. Pork (Pork meat meal (24%) Fresh Pork (19%)), rice (26%), sweet potato, chicken oil, beet pulp, Pork digest, linseed, fish oil, prebiotic FOS, prebiotic MOS, yucca extract, glucosamine, MSM, chondroitin, nucleotides. Vitamin A 18,000 IU, Vitamin D3 1,300 IU, Vitamin E 126 IU. Zinc chelate of amino acid hydrate 250 mg, Ferrous sulphate monohydrate 125 mg, Zinc sulphate monohydrate 208 mg, Manganese sulphate monohydrate 87 mg, Copper chelate of amino acid hydrate 25 mg, Ferrous chelate of amino acid hydrate 21 mg, Cupric sulphate pentahydrate 30 mg, Calcium iodate anhydrous 1.8 mg, Sodium selinite 0.5mg. Antioxidants (rosemary & tocopherol-rich extracts). There are currently no questions for Arden Grange Adult Rich in Fresh Pork & Rice Dog Food - be the first to ask one!